Across the street you can see the Marie H. Reed Community Learning Center. It opened in 1977 on the former sites of Morgan Community School and Happy Hollow Playground. Both the Adams and Morgan elementary schools became "community schools" in the 1960s. Their curricula and policies were controlled by locally elected residents with the cooperation of the D.C. School Board. The schools also provided important social services. The new Reed Center followed suit with a public health clinic, child care center, adult education, and swimming pool. Its name honors Bishop Marie H. Reed (1915-1969), founder of Sacred Heart Spiritual Center and leader of the community school movement. white schools were under-enrolled due to "white flight" to the suburbs. When the Supreme Court ruled that school segregation was unconstitutional in 1954, Washington's schools were ordered to desegregate immediately as a model for the nation. Here, black and white community members had already laid the groundwork for better schools and improved race relations. 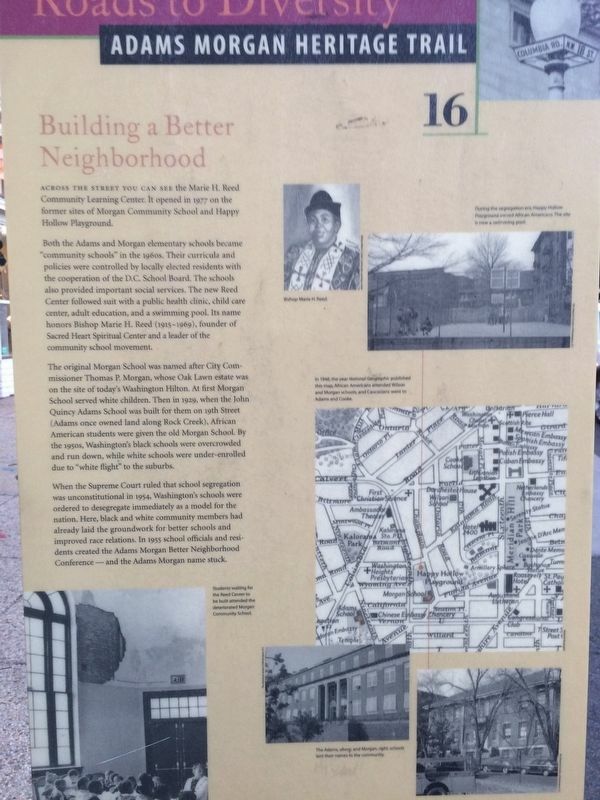 In 1955 school officials and residents created the Adams Morgan Better Neighborhood Conference—and the Adams Morgan name stuck. Location. 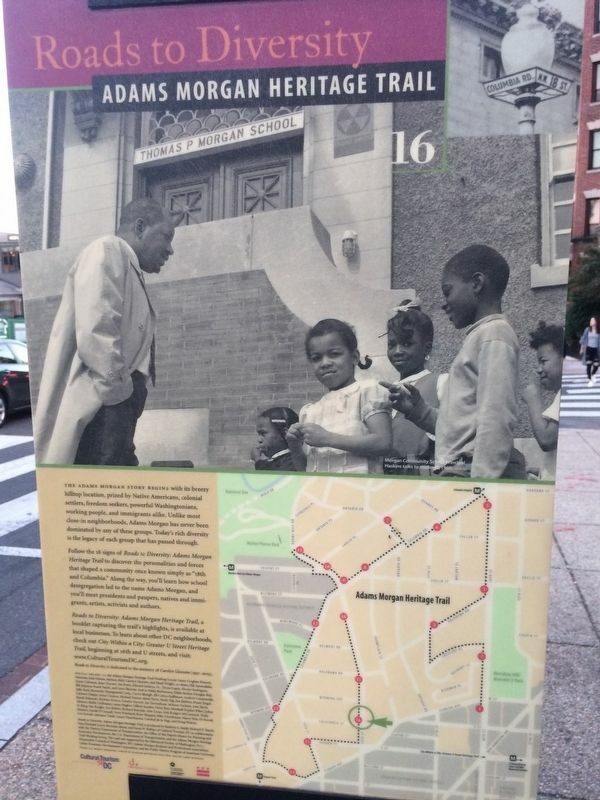 38° 55.073′ N, 77° 2.505′ W. Marker is in Adams Morgan, District of Columbia, in Washington. Marker is at the intersection of 18th Street Northwest and California Street Northwest, on the right when traveling south on 18th Street Northwest. Touch for map. Marker is at or near this postal address: 2100 18th Street Northwest, Washington DC 20009, United States of America. Touch for directions. Other nearby markers. At least 8 other markers are within walking distance of this marker. Urban Renewal Era (about 600 feet away, measured in a direct line); Calvin T.S. Brent Residence (approx. 0.2 miles away); You are in the "Strivers' Section" (approx. 0.2 miles away); a different marker also named You are in the "Strivers' Section" (approx. 0.2 miles away); "Best Addresses" (approx. 0.2 miles away); Rooms With a View (approx. ¼ mile away); President Reagan Assassination Attempt (approx. ¼ mile away); 1700 Swann Street (approx. ¼ mile away). Touch for a list and map of all markers in Adams Morgan. More. Search the internet for Building a Better Neighborhood. Credits. This page was last revised on March 21, 2019. This page originally submitted on October 21, 2017, by Devry Becker Jones of Washington, District of Columbia. This page has been viewed 143 times since then and 10 times this year. Last updated on March 7, 2019, by Devry Becker Jones of Washington, District of Columbia. Photos: 1, 2. submitted on October 21, 2017, by Devry Becker Jones of Washington, District of Columbia. • Bill Pfingsten was the editor who published this page.